Ladies & Gents, fire up those chess computers and dust off those practice boards – we’re launching a Puzzle of the Week! This is strictly for fun only – no prizes for getting it right, other than a swelling of pride in your performance and the unyielding respect from your fellow Hammerites. To get things rolling, we start here with a puzzle from 1900, of “intermediate” difficulty. 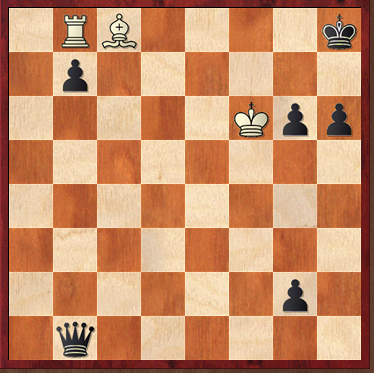 White to move – have a think, and leave your solution in the comments. We’ll announce the winner in our next Puzzle of the Week post! 1.Be6+ Kh7 2.Bg8+ Kh8 3.Bb3+ Kh7 4.Rxb7+ Kh8 5.Rb8+ Kh7 6.Bg8+ Kh8 7.Rxb1 etc..
Be6+, Kh7, Bg8+, Kh8, Ba2+ captures queen? 1.Be6+ Kh7, 2.Bg8+ Kh8 3.Bb3+ Kh7 4.Rxb7+ Kh8 5.Rb8+ Kh7 6.Bg8+ Kh7 7.Rxb1 for the win. Bf5. Not to get the queen but mate the next move with g6? …yes, I’m too late to give the best answer! Next Next post: GM Chris Ward Simul – Last Chance!